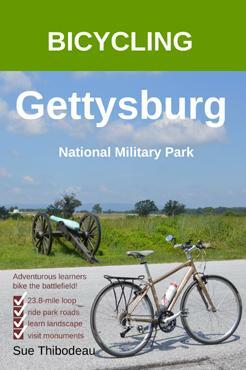 This exercise will help you to plan a bicycle route that includes finding state monuments at Antietam. A map and some photos are your tools. Engage your brain before you start pedaling. If you know understand U.S. Postal code abbreviations, then you should be able to complete this exercise without doing any research. Can you find these sites on a map? Give it a try! Bicyclists would do well to begin at the Visitor Center and walk to the New York State Monument on the grassy hill there. The Maryland State Monument is very close to Smoketown Road, where there is an opening in the park fence. This is a very convenient location to lean your bicycle on the fence and walk along a short grassy trail to the monument. The remaining five state monuments are conveniently located on park roads; follow the signs for Auto Tour Stops 1-4. 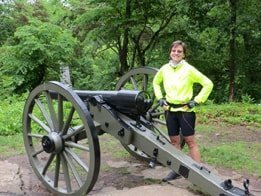 Thanks for Finding State Monuments at Antietam!